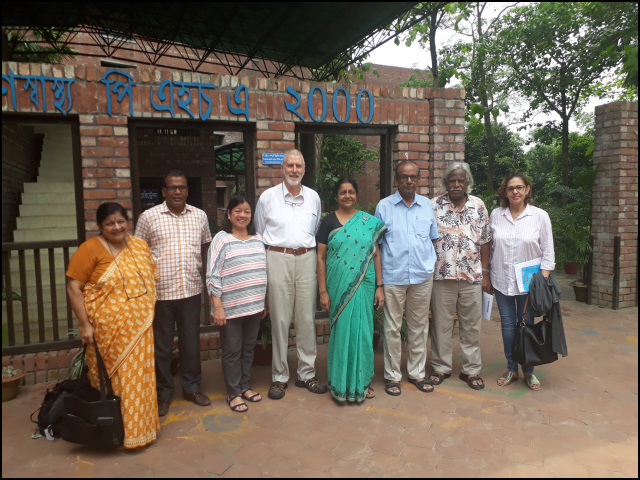 Members of the HAIAP-PHM International Steering Committee (ISC) met at Gonoshasthaya PHA, Savar, Bangladesh during May 15-16, 2017 to discuss the planning and agenda of the proposed November meeting. Dr. Mira Shiva, India (All India Drug Action Network); Dr. Manzur Kadir, Gonoshasthaya Kendra (GK); Dr. Edelina P. Dela Paz (Delen), Health Action Information Network, Philippines (People’s Health Movement representative for PHM Global Steering Council); Dr. Ken Harvey, School of Public Health, Monash University, Australia; Dr. Laila Parveen, Gono Bishwabidyalay; Dr. Qasem Chowdhury, GK; Dr. Zafrullah Chowdhury, GK; Shila Kaur, Health Action International Asia Pacific (HAIAP) Coordinator, Third World Network, Penang, Malaysia. In addition: Md. Fazle Karim, Management Sciences for Health (MSH) and Dr. Ishak Ali, GK attended. It was decided that holding a major meeting on the theme of “Revive Health for All” in November 10-14, 2017 was too ambitious and this meeting should be postponed for later in 2018. People were having difficulty obtaining funds for air-travel, PHM had no resources to commit, donor funding did not look promising and several people had committed to attend a Nutrition Conference with dates close by. It was accepted that the proposed “Revive Health for All” conference, and the issues outlined, were still of great relevance but more time was required to finalise the planning and explore options for funding. Instead, it was agreed that a HAIAP meeting would be take place at GK from November 10-12, 2017 concentrating on one of the issues previously identified: Ensuring Access to Affordable, Safe Quality Essential Medicines and their Rational Use. There would be a focus on antibiotic resistance, the failure of a profit-orientated pharmaceutical system to meet the challenge of providing new antibiotics, the role of antibiotic guidelines and other educational initiatives, meeting the challenge of pharmaceutical promotion and a multi-country study on drug pricing. Relevant country stories would be solicited and presented (action-orientated initiatives that have made a difference). The aim is to stimulate HAIAP members to further action, nurture younger health activists by promoting intergenerational exchange and identify underlying problems for placing on the agenda of a 2018 meeting. Regrettably, HAIAP is unable to provide financial assistance for travel to Bangladesh. However, GK has committed to providing full hospitality for this meeting including airport pickup and drop, modest accommodation, all meals and AV facilities. A full report of the ISC meeting is available here. This entry was posted in Education, Medicine policy, Pharmaceutical Promotion and tagged Bangladesh, Essentials medicines, GK, Gonoshasthaya Kendra, HAIAP, ISC, Rational use. Bookmark the permalink.